The longer the economy stays at this pace, the better it will be for firms and Oregonians, Duy said. Opportunities exist to both pull into employment people who were marginalized during the recession and for greater economic development. UO President Michael H. Schill provided welcoming remarks to the audience of 300. Alcohol, tobacco, lottery and marijuana were the focus during the “Oregon’s Growing Sin Economy” panel. Josh Lehner, economist in the state’s Office of Economic Analysis said these vice taxes contribute $2–3 billion per biennium, representing 3 percent of the state’s revenue. That number, however, doesn’t fully capture taxes on legalized marijuana. 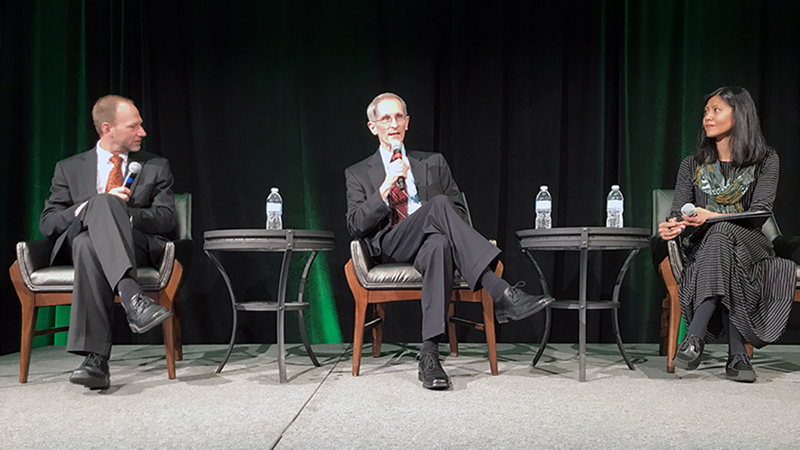 Lehner and Hansen discussed how sales of cannabis might be affected in the future based on social acceptance, federal involvement and potential public health issues. The keynote speaker, Lawrence Mishel, president of the Economic Policy Institute, discussed the effect of robots and automation on the labor force. “Robots get a lot of attention. In periods of high unemployment, people gravitate to an explanation that automation is to blame,” he said. “Robots are really a distraction for the main crisis at stake, which is the crisis of job quality and wage stagnation. Mishel points to the last 150 years as evidence robots are not taking jobs. “If automation were responsible for unemployment, then we would see a higher rate of unemployment every decade since 1830,” he said. “The dynamic is that automation leads to the displacing of some jobs, but to the creation of others.